Cane Bay Plantation is roughly equidistant between two of the most charming and unspoiled towns in South Carolina’s Lowcountry: Summerville and Moncks Corner. Cane Bay Plantation is a thoughtfully master-planned community that will meet all your lifestyle needs, including easy access to churches, schools and businesses – a place where families grow and thrive. Perhaps the most enticing feature of Old Rice Retreat, a Centex Homes community within Cane Bay Plantation, is the layout of the>neighborhood. Virtually every home site backs up to water or wetlands and almost none abut other home sites. Add to this the miles of pedestrian-friendly paved trails that will wind through Cane Bay Plantation for walking, biking or roller blading, and the outdoor, family-friendly nature of the community becomes clear. The Sweetwater section of Old Rice Retreat features nine separate floor plans, ranging from 1,841 to 3,087 square feet and priced from the low $200s to the low $300s. Configurations start at three bedrooms with two full baths and cap at five bedrooms and three-and-a-half baths. Among the luxury features of the homes in Sweetwater are hardwood foyers, 42-inch cabinets with hardware, gas fireplaces and remote garage-door openers. Family rooms at Sweetwater offer ceilings from a cozy 9 feet to a soaring 19 feet, depending on which floor plan you choose. Among some of the options offered include sun rooms, irrigation systems, home-theater sound systems, crown molding, chair railing, third-floor bonus rooms, three-car garages and four-foot garage extensions. To assure an eclectic appearance at Sweetwater, several floor plans may be customized with one of three exterior options – a full brick front, double porches or shaker shingles. An amenities center that will feature a country-club-style swimming pool, a separate children’s pool, two tennis courts and an open air pavilion is coming soon. To add to its allure, with its easy access to Interstate 26, Sweetwater at Old Rice Retreat is only 30 minutes from downtown Charleston, where you’ll find fine dining, outstanding shopping and a host of cultural activities. Some of coastal Carolina’s most popular waterways and beaches are only minutes beyond Charleston. 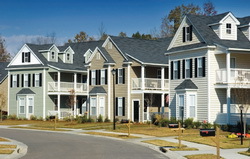 For additional information on Sweetwater at Old Rice Retreat, visit www.Cane-Bay.com or call the sales center at (843) 761-4410.